You are here: Home » Supports » Parent to Parent Support » Why Cuidiu? In Cuidiú our aim is to support parents through all the stages of parenthood whether you are the parents of a newborn baby or parents of school-going children. As volunteers and as parents ourselves, we are aware that issues and challenges change and evolve during the journey of childhood and we try to support parents in their role, in order to help make parenthood the joy it should be. Having a baby is the biggest life change most of us will experience. It can be the most rewarding, but also the most challenging, not to mention worrying! Parent to Parent Support Other parents become 'Parent to Parent' supporters (P2Ps). This peer support is all about one parent listening to another parent and providing support or information when necessary. P2Ps are available to you in a group setting in your branch, by email, online or by phone. The Parent to Parent Supporters are trained in facilitation, non-directive counselling skills and effective communication. They are willing to provide a listening ear for anyone to talk in confidence about the ups and downs of parenting. Experience and Resource Sharing Cuidiú also operates an Experience and Resource sharing facility which is a list of parents who have or had a particular 'parenthood' experience and are willing to talk and share with others about that experience. Parent to parent supporters may also be able to pass onto you, local or national resource information in order to support you in a difficult situation. Parent to Parent Events Cuidiú branches hold evening events which are informational and educational. These will be talks given on various subjects of interest to parents. Usually a professional will be invited to the branch. 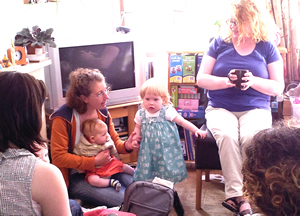 Parent Support Mornings These are coffee mornings held in some branches which allow Mums to talk, in confidence, of postnatal depression or feeling low about parenthood. Parenting Book Club A once a month meet up, where a person reviews a parenting book or parent related book. Usually an evening event in a coffee shop or other venue. The book may be a book someone found helpful or not so helpful on their parenting journey. No need to read anything either....parents come along and listen to the review and ask questions about the book. It is a social way to share ideas about parenting without spending time and money on a book. See local event calendars for evening events. If you are feeling vulnerable, need support or are feeling a little low about parenthood, being able to talk about concerns and share experiences with others in the same situation as you can be very helpful. See our Parent to Parent supporters contact list and Contact someone locally in Cuidiú today. Our P2P Supporters are volunteers and parents who meet in Cuidiu groups or take calls in their home setting or who you can email or text or phone.